West Hampstead Life | Will West Hampstead have a rosy view of Rosa’s Thai Café? It was Bank Holiday Monday, we were on the way back from a swim at Swiss Cottage, and feeling a bit peckish. Time to try West Hampstead’s newest kid in town – Rosa’s Thai Cafe. We were not alone. The place was pretty full when we arrived past 1pm and got even fuller over lunch. Au revoir Ladudu, hello Rosa’s Thai Cafe. The team has done a quick and efficient job at refurbishing the old Ladudu, but it did feel a little corporate. The decor is a mix of industrial and Scandi-chic (Scandustrial?) with little reference to Asia, unlike Ladudu. I had to stop myself from getting up to scuff the perfect walls a bit. 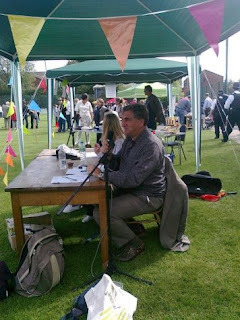 In the background a gentle Ibiza soundtrack. All nice enough but could have been anywhere. 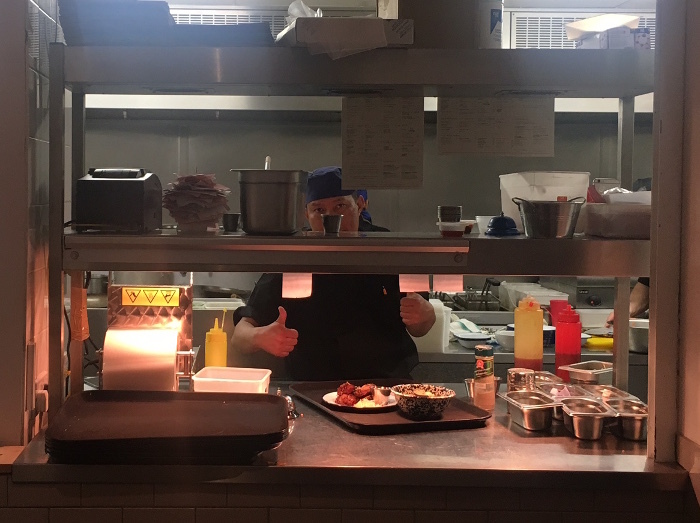 The staff were nice and friendly and coping well with a busy dining room. In fact the manager later confessed that they have been busier than expected since it opened last week. Still having teething troubles though – their phone number doesn’t work, yet. 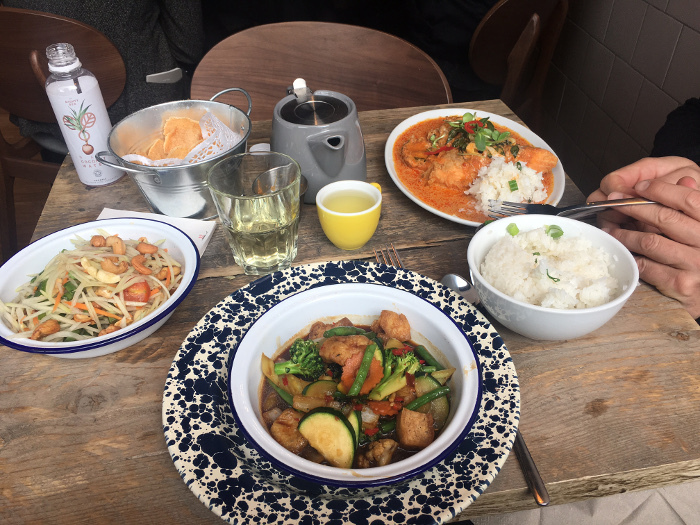 Rosa’s offers both an evening and (cheaper and simpler) weekday lunch menu, although as it was a bank holiday we were offered the main dinner menu with dishes priced slightly above that other West Hampstead stalwart, BananaTree. Despite being busy we didn’t have to wait too long to order, or for our food to arrive. As it was a self-imposed meat-free Monday I stuck to the vegetarian options – there were plenty – ordering the chilli and Thai basil stir-fry while my dining companion ordered crispy salmon in curry sauce plus a green papaya salad and coconut rice to share. For drinks we had raw coconut water and lemongrass tea, both good and exactly what I feel like drinking when eating Asian food – different options that nearby Pham House doesn’t alas offer. The menu has a good selection of dishes – some favourites (its website says that across its other eight branches Rosa’s has served over 400,000 pad thais) plus other regional dishes. The salmon was the best dish we ordered, while the stir-fry was OK but the salad lacked a bit of bite. However, the mix of flavours got better as the meal went on and we finished it all off. The bill, including service, came to just under £50 (£25 a head), which felt about right. It’s thumbs up for Rosa’s. Thanks to Teresa for passing on the baton to Rosa’s. It was her choice of restaurant to replace Ladudu. Part of me is a little sad that chain (albeit a mini-chain) Rosa’s is able to do better what she was doing. But Rosa’s is also about the personality and both by the door and on the website you can pick up recipes from founder Saiphin so you can cook some of the dishes yourself. 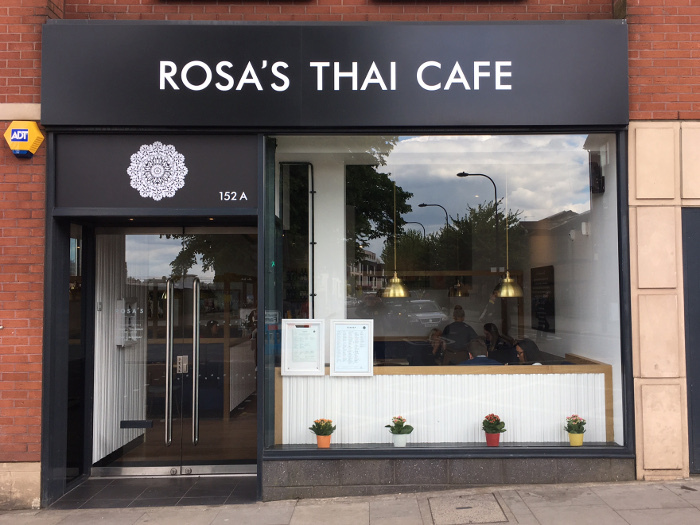 The future for Rosa’s Thai Cafe in West Hampstead looks rosy.